Kolkata: A lot of dramatic sequences are in store for the viewers of Aakash Aath’s family drama, Briddhasram! 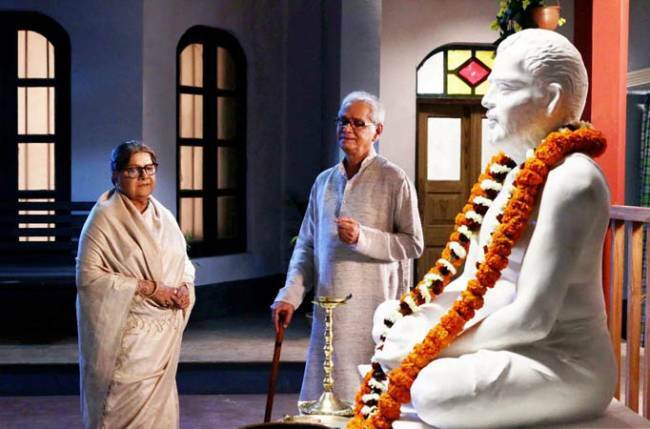 Loyal viewers of the mega would know that Aakash (Rajib Bose) and Mimi (Anindita Raychaudhury) had asked for forgiveness from Jashoda ((Lily Chakraborty) and expressed their wish to take her back to their flat. Now read on to know what will happen next. A source associated with the show shared that in the upcoming episode even after her family’s repeated requests Jashoda will not return home. Then standing in front of the photo of Satinath (Manoj Mitra), she will say to herself that now she is free from all the attachment…now she will start a new life. Meanwhile, Roshni (Anwesha Hazra) will come to inform Jashoda that they have decided to marry off the Acharya couple again on their wedding anniversary. This news will make her happy and soon the entire team of ‘Shesher Kobaita’ will get busy with the preparation of wedding ceremony. Through this wedding and with the help of media, mastermoshai would want ‘Shesher Kobaita’ to reach more people. Will mastermoshai be successful in his mission? What is the fate of Jashoda and ‘Shesher Kobaita’? Only time will tell.